This popular activity – which aims to reach all lovers of poetry – has been offered every IAP for the last twenty years. Each one-hour session is devoted to a single poet, usually a single poem. The goal is discussion and shared pleasure. No lectures or professorial arrogance allowed. Some participants attend every session, but many others attend only once or twice to read and discuss a favorite poet or poem. The roster of poets is always immensely diverse: from ancient Chinese masters to contemporary American poets laureate, from such famous Greats as Shakespeare, Keats, and Auden to Dr. Seuss and Bob Dylan. Discussion and collaborative close reading are the aim and ideal of each hour. Perhaps you have heard of one of America’s premier orators, writers, editors, and activists for civil rights. 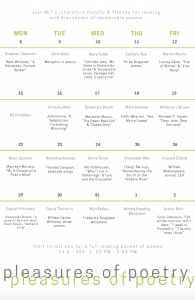 Perhaps you’ve noticed that Frederick Douglass has “done an amazing job and is getting recognized more and more”—appearing on syllabi across the nation and this fall at MIT in Literature and History. Maybe you are curious about how this gripping story of one man’s escape to freedom made him the most-photographed person in 19th-century America. Join Literature friends and fans for a daylong reading of Frederick Douglass’s Narrative of the Life of Frederick Douglass, an American Slave. Written by Himself (1845). 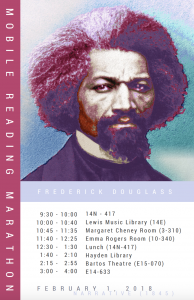 All participants can enjoy reading or just listening to Douglass’s inspiring words. We will convene at various sites on campus that engage with MIT’s role in the history of civil rights. Activities will include lunch and refreshments; discussion of Douglass’s three autobiographies (with a demo of digital visualizations of the texts); and a portrait gallery.